A Syrian refugee walks past makeshift shelters in an unofficial camp for refugees in Iaat in Lebanon's Bekaa valley, on Tuesday. The storm hit Saturday and has affected at least "151 informal camps in Lebanon, which host 11,000 refugees," United Nations refugee agency spokeswoman Lisa Abou Khaled told NPR. She said at least 850 other makeshift shelter sites, which host a combined 70,000 refugees, are also at risk of being damaged from the bad winter weather. 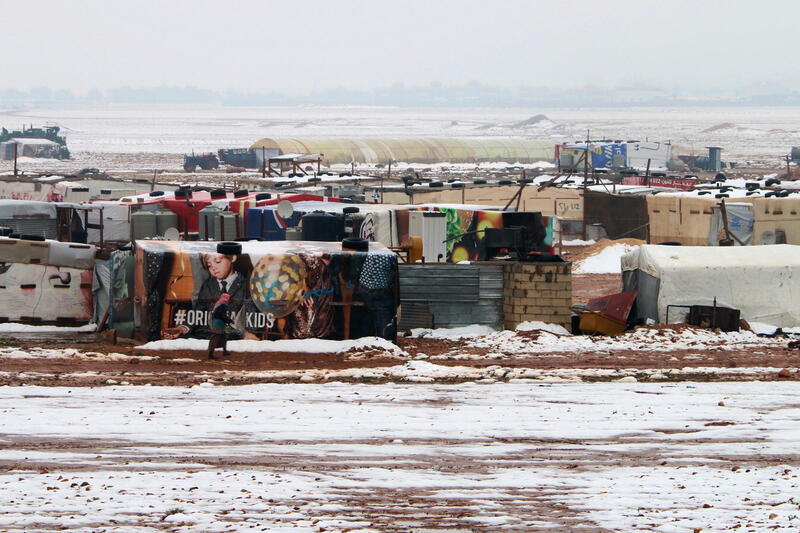 Images of some of the camps give a glimpse of flooding and other impacts for families who fled violence in Syria to neighboring Lebanon. One video by Lebanese charity Sawa for Development and Aid shows a refugee in eastern Lebanon's Bekaa Valley kneeling on a wooden pallet and rowing to safety using a mop. "My tent has been flooded now for five days. I am 10 meters [about 33 feet] from the river so all the mud, sewage, and trash from the river has come into my tent. This is not a way to live," Said said. 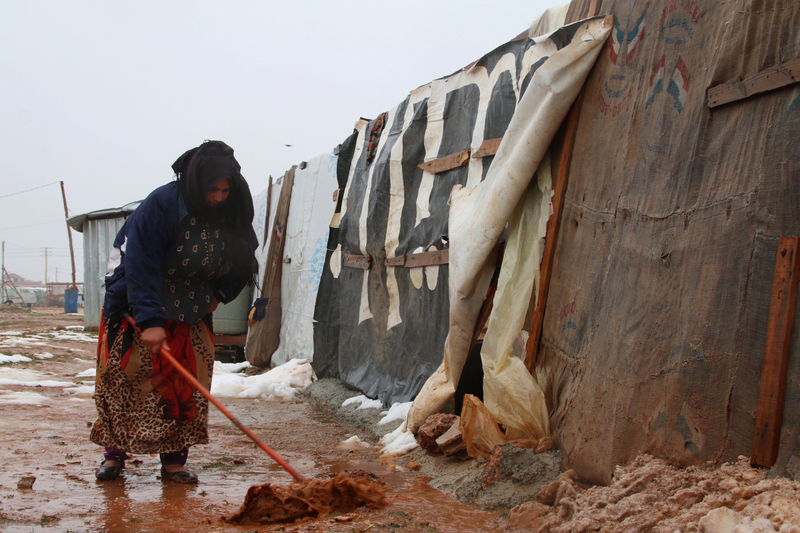 A Syrian refugee shovels mud in front of a makeshift shelter in an unofficial camp for Syrian refugees in Iaat in Lebanon's Bekaa Valley on Tuesday. "We have not been able to sleep. I don't know what I would've done without the help of my neighbors. They've been cooking for us and have helped us clean out one room for all my family to sleep in. We've been sharing one semi dry carpet they lent us," Said said. He says his youngest child Maha, 1 month old, is in danger from the flood. "This storm has made our tent so cold and dirty and wet and it has made my wife very sick, to the point where she isn't producing milk anymore." Hamoud said Said has not received medical care he needs. "He needs surgery, he has a hard time walking. Two of his other children are also sick, one of them has a speech impediment. It's just problem after problem after problem. ... A little more rain and snow and his tent would've collapsed on their heads," Hamoud said. There are more than 1.5 million Syrian refugees in Lebanon, according to U.N. figures. Lebanon's government forbids official refugee camps for Syrians, so the only options they have are makeshift shelters mostly made out of scrap material. The U.N. refugee agency, UNHCR, says most of these refugees have "little or no financial resources ... and around 70 percent live below poverty line." UNHCR spokeswoman Abou Khaled says the agency and nongovernmental organizations in Lebanon have been distributing relief items to refugees affected by the storm. "We've been giving plastic sheets for damaged tents, mattresses, rubber boots and other goods because of the rain," Abou Khaled said. "There were three people stuck in a tent. They were snowed in and among them were children. We had to to call the Red Crescent to save them," Abou Khaled said. Many refugees say the aid groups are not doing enough. Said says this is the second time his tent has flooded this year. He added, "You'll only believe it if you come here and witness it with your own eyes."